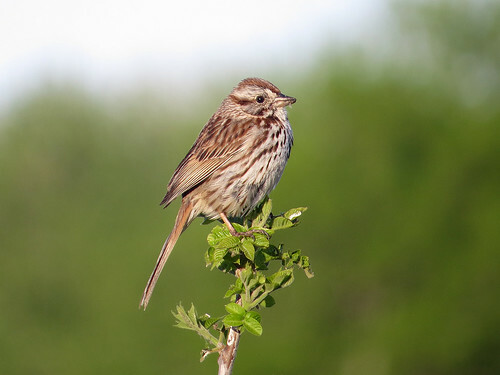 The second bird in our 2014 Bonanza is a North American sparrow: the Song Sparrow! In our clue yesterday, we indicated that the Song Sparrow is an LBJ with a lot of range. What did we mean? "LBJ" stands for "Little Brown Job", a phrase sometimes used to describe dull-colored small songbirds that may be difficult to identify. Song Sparrows are brown and streaky. They may be identified by the dark spot in the center of the breast, among other traits. When talking about range, we were referring to a few different things. Song Sparrows are found all over North America, so they have a large natural regional range. Song Sparrows are named for their song repertoire. In their voice they have a lot of range. Song Sparrows have over 20 recognized subspecies; up to 50 subspecies may exist. These differ in physical characteristics; the appearance of Song Sparrows has a lot of range. Song Sparrow joins Birdorable today as our 559th species, and our 10th species of sparrow. 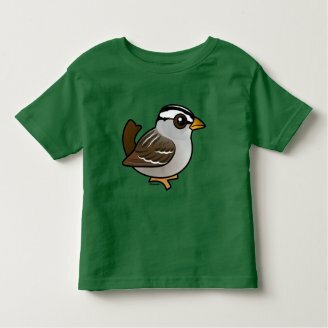 If you like Song Sparrows as much as we do, be sure to check out our selection of cute Birdorable Song Sparrow t-shirts and gifts. Our Bonanza continues tomorrow with a species that comes with its own opposite! Can you guess tomorrow's species? 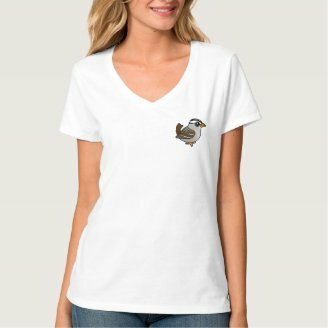 Today the Birdorable Eastern Towhee makes its debut! Eastern Towhees are bulky, boldly-plumaged sparrows. 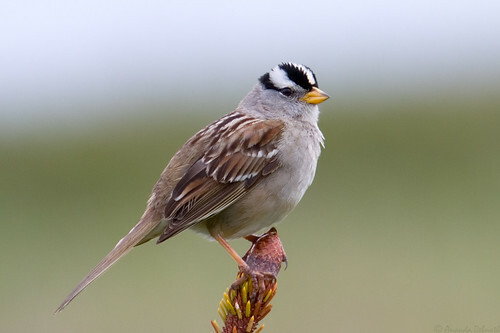 They live across eastern North America; birds that breed in the north are migratory. They are ground feeders, scratching at the earth with their feet to reveal seeds or insects to eat. 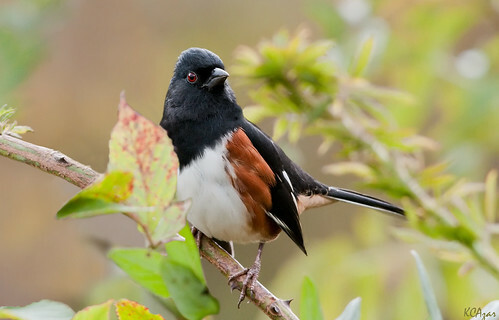 Male towhees have a varied repertoire of songs and calls. One familiar song sounds like the phrase "Drink Your Tea!" The following recording includes this phrase, and a few others. Tomorrow's bird is a common continental corvid. Can you guess what it will be? Dark-eyed Juncos are small migratory songbirds that live across parts of North America. Here are some cool facts about the Dark-eyed Junco: 1) Because of their high population (estimated at 630 million individuals! ), their relative tameness, and their affinity for back yard bird feeders, the Dark-eyed Junco is one of North America's most recognized birds. 2) The oldest known wild Dark-eyed Junco lived to be at least eleven years old! 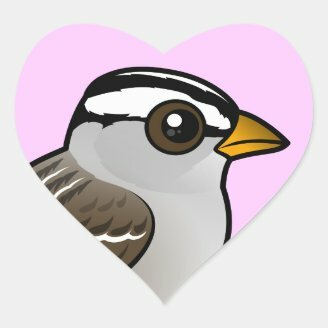 The average lifespan for a bird that survives to fledge is about three years. 3) The Dark-eyed Junco is a species of sparrow, closely related to White-crowned Sparrows, Harris's Sparrows, and others. 4) Up to 15 different subspecies of Dark-eyed Junco are recognized. These are usually divided into five (sometimes six) major groups: Slate-colored Junco; White-winged Junco; Oregon Junco; Pink-sided Junco; and Gray-headed Junco. 5) The four-letter code that banders and birders use for the Dark-eyed Junco is DEJU. 6) Many Americans consider Dark-eyed Juncos to be "snow birds" because they appear at backyard feeders during the winter months. However, DEJUs live year-round in other parts of the USA, including across parts of the Appalachian and Rocky Mountains. 7) Most Dark-eyed Junco nests are comprised of four eggs; incubation takes about 12 days. Baby juncos begin life totally helpless but are able to leave the nest just 10 days after hatching! They are completely independent from their parents after just 26 days. 8) Dark-eyed Juncos are susceptible to nest parasitism by Brown-headed Cowbirds. 9) Dark-eyed Juncos move in flocks during the winter, numbering from a handful to 30 or more individuals. A complex hierarchy based in part on testosterone levels exists within the group, with adult males dominating over juvenile males, adult females and juvenile females. The flock usually remains in a territory of about ten acres during the entire season. 10) Dark-eyed Juncos are known for eating seeds at feeding stations, but they also eat insects. During the summer, nearly half of their diet may consist of insects. If you can't get enough of Dark-eyed Juncos, you're in luck! 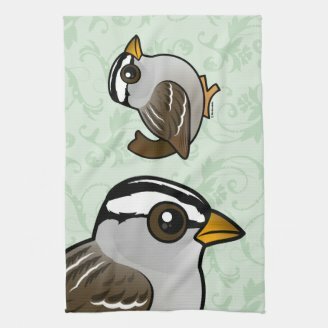 We have the five most common sub-species of DEJU on Birdorable. 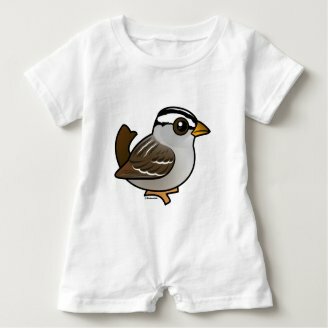 We also have some cute designs featuring these loveable birds: Three Christmas Songbirds; Snow Birds; Junco Junkie; and J is for Junco.